Lowest prices and widest selection anywhere for GenuineBB Sealed Lead Acid Batteries. 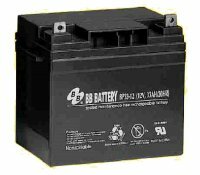 BB Battery (also known as Best & Best Battery or B&B Battery) is one of the premier sealed lead acid battery companies in the world. B&B Battery is one of only 3 companies that makes their batteries from raw materials, instead of assembling components purchased from other companies. This allows them to keep strict quality over all aspects of manufacturing. B&B batteries are shipped as original equipment components by many of the world's biggest names in consumer and industrial equipment.